Continuing the series on the ‘Modern Swedish Farmhouse’ style condo projects, it’s all about renovating a condo bathroom today! It was a typical standard mid ’80’s condo bathroom. This space was small and even though the walls and fixtures were light in color, the space felt dark and small. Here is how this renovation project drastically changed that. First, the floor plan was slightly changed from how it used to be. In the photo above you can see the bathroom had a small linen closet in the corner opposite the vanity that really cut into the space. By removing that linen closet and opting for an open shelf unit to free-stand in the bathroom on the opposite side of the room, gave the space to also move the entry door down a bit so that the toilet wasn’t visible from the front hall when the bathroom door is open. My grandson and I stopped by one day to check on the progress. (yep, that’s his little head peeking around the corner to see if this really is a bathroom) That pile of insulation in the far corner is where the bathtub once sat. A huge difference was instantly realized with the addition of this tubular skylight! Although this bathroom has no exterior walls, thus no natural light, installing a tubular skylight allows natural light to stream in and it’s really amazing the difference! When it’s first installed, you keep thinking to turn off the light when you leave the bathroom, but then remember there’s no light on, it’s the tubular skylight. What a super smart invention these things are! The walls in the hallway and a few key design elements in the great room of the condo have a whitewashed barnwood planking treatment that I felt would have not been conducive to this small bathroom area, but yet still wanting to repeat that barnwood grain, this porcelain floor tile was the perfect answer. It gives a nod to the rest of the ‘Modern Swedish Farmhouse’ style wood in the rest of the condo. For the rest of the space, we selected a very decently priced ceramic tile, and added the character with a classical design for the layout. The tub received a mixed treatment of tile, subway on the lower section and diagonal on top. 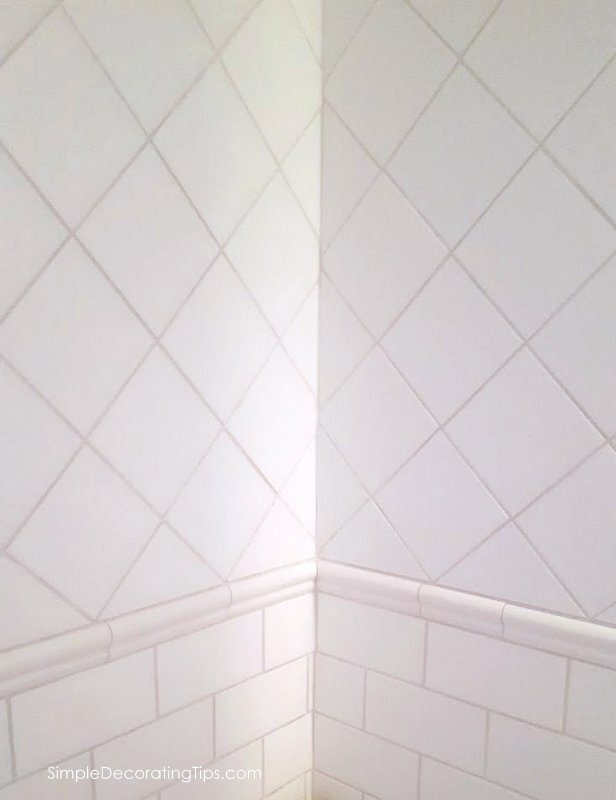 The walls around the entire perimeter of the bathroom received the same subway tile with a chairrail height trim, with white painted upper walls. Clean and steam-line is key to aid in an easier cleaning job in the bathroom, and this toilet is perfect for that. Plus, by keeping it small, gives visual space between the tub and vanity, another tip to make the space appear larger. In the far corner on the left of the picture below, you can see the handsome open shelving unit that replaced that awkward linen closet before. Another huge key feature to this new design in renovating a condo bathroom is the mirror. It goes all the way from the ceiling to the counter. It’s amazing how that will ‘push’ the ceiling up. The vanity now, (this vanity was a fantastic buy, with great quality and prefinished in this wonderful grey paint) has open feet. Just that tip alone makes the space feel more spacious… causing the eye to see beyond somehow tricks the mind to make us feel the space is larger. Here’s another enlarging tip: Mount the mirror all the way from the countertop to the ceiling. When the mirror goes all the way to the ceiling and you mount the lights through the mirror, it’s almost like you get 2 for 1 as the lights are reflected, doubling their effect. There is one more amazing difference we made to this bathroom renovation… The door was a massive change! But I’m out of time for now, so I will show you that door change next time! Be sure to check back, (or better yet, sign up at the bottom of this post, and I’ll email you when a new post is published) it’s amazing! Click here to see all the posts on this ‘Modern Swedish Farmhouse’ style condo renovation. Shopping guide: All of the fixtures for this bathroom reno project were purchased online, here are the links: Air Bathtub, Tub Faucet, Toilet, Toilet Seat (yup, that needs to be ordered separately. This is my favorite, quiet close style in the right size for this toilet), Prefinished Grey Vanity, Sink Faucet, Here are several choices for a Tubular Skylight depending on your needs. Hi — I love what you did with this bathroom as a designer. However, two questions/comments: 1) as a designer for this project did not you have to be sure that the tubular skylight was approved, or at least talk with the condo owners to make sure they had approval most HOA do not allow these kind of changes in condos/townhouses) and 2) unless this is a “master” bathroom why all the stuff in baskets, et al.? Seems to me that it would look larger if there was was no shelving and the rest? This is an extremely small area and though it’s been remodeled and well-done it does seem a bit overcrowded. That’s why there a lovely sink cabinet. Great questions Margaret. So for the first question yes I’m a designer but this condo belongs to friends of mine. I help them to create a vision that they had but I was not involved in it as a designer with the day today and planning and such. The husband actually used to be a builder so he handled that end of it quite well. And for the second question yes this is the master bathroom. Even though the only door leaves from the hallway the master bedroom is right next to it. It’s a very small condo. Very pretty! I love the vanity–gotta love Home Depot! These days they are really upping their style quality compared to years before –especially with all their online choices! I love the tile choices, too-classic and timeless. I totally agree Phyllis, Home Depot has wonderful, affordable style. Bathroom is very clean and calming. Question: Most condo associations won’t allow a skylight. Did yours? Thanks for that good thought Maureen. I’m not the owner of the condo, I was just helping them with design. However, I do wonder if because a tubular skylight isn’t an actual skylight with all the issues of leaking and extra framing issues an association would be more likely to approve it?